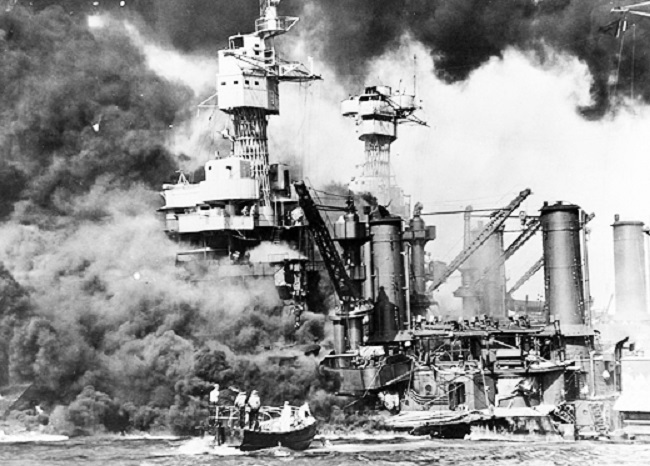 The USS West Virginia was sunk at Pearl Harbor, Hawaii, Dec. 7, 1941. Seventy-seven years ago, the Japanese bombed Pearl Harbor in a surprise attack that led to the entry of the U.S. into World War II. Some 2,403 Americans were killed that day, and another 1,178 were injured. Seaman 1 Class Leo Greenwood was aboard the USS West Virginia when it sank on Dec. 7, 1941. The oil on the water’s surface was ablaze, and Mr. Greenwood was forced to swim below the flames to make it to shore during the attack after the abandon-ship order was issued. Years later a diver found artifacts, including a pocket watch and photo album from Leo’s footlocker aboard the ship, and turned them over to the National Pearl Harbor Survivors Association, where they ultimately made their way back to him. Mr. Greenwood was born in Farley, Iowa, a small town near Dubuque, and grew up in the Dubuque area. After his discharge from the Navy, he worked for the same company for more than 30 years in Dubuque. After his retirement, he returned to work part-time at the greyhound racing track in Dubuque as well. Greenwood passed away in 2005 and is buried in Farley, Iowa. Records on file at Department of Veterans Affairs and Department of Defense indicate he was honorably discharged, and his service period was 1939-1942. This year’s ceremony will honor the addition of Mr. Greenwood’s name on the memorial. His name was inadvertently left off the wall. The 2018 memorial ceremony will be held Friday, Dec. 7 at 11:40 a.m. at the Pearl Harbor Memorial on the grounds of the Iowa State Capitol. Members of the Greenwood family will be present for the name unveiling so that this American hero can truly be honored and remembered for his service. Immediately following the ceremony, a luncheon will be held at AMVETS Post 2 at 2818 Fifth Ave. in Des Moines to meet and greet Mr. Greenwood’s family and other members of the Sons and Daughters of Pearl Harbor Survivors. For more information about this year’s ceremony, call 319-728-2486 or 515-782-3217.